NECA's goal to take everything McFarlane Toys did and render it obsolete continues apace. After a relaxing cabin vacation doesn't go as planned, Ash is left with three dead friends, an undead girlfriend and an angry evil spirit on the loose. As nightfall approaches, Ash must prepare to again battle the legions of the damned if he wants to make it to dawn. 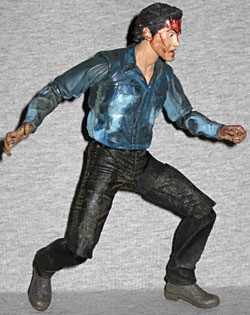 In traditional style, NECA's Evil Dead 2 line relies heavily on re-use: the first series includes two Ashes - this figure and Deadite Ash - and the second series will have yet another. That third one will be the "iconic" version, with the torn shirt and the chainsaw, and when we review that, we'll give you a direct comparison photo between NECA and McFarlane (because doing so before the matching figure comes out would be asinine). Until then, you'll just have to use your imagination. And the description below, since a good 80, 85% of the figure will be the same. 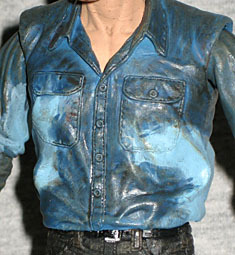 Ashley J. Williams' iconic costume is a blue shirt and dark jeans, and that's what this figure has. Adrienne Smith sculpted the figure, and did a nice job. The pants are sculpted directly on the legs, while the shirt is a PVC shell over a detailed torso beneath. That may seem excessive, but it means they don't have to remold the torso to make a "ripped shirt" version later. Re-use is the name of the game, folks! 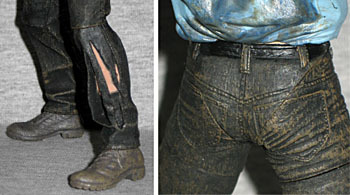 That's the same reason his jeans are torn on the left shin: because they need to be reused for all the figures, and the non-torn version is so inconsequential that nobody is likely to notice if the rips are there too early. I don't know at what point in the story his pants get shredded, is what I'm saying. The likeness, it must be said, is not perfect. We rewatched ED2 in preparation for these reviews, so it can't be chalked up to a case of misremembering what Bruce Campbell looked like when he was young: he may just be a guy whose likeness is impossible to turn into a small sculpt. But while the likeness may not be perfect, it is very very very very very very good. It is a great likeness. 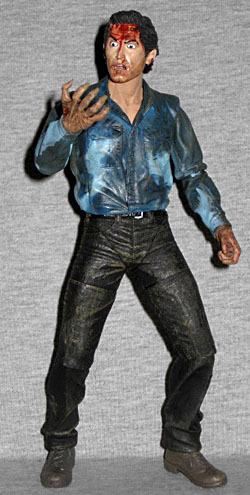 It is one of the best Bruce Campbell likenesses ever put on a toy. Changes could be made to improve it, but none need to be made, understand? The paint on these figures is all over the place. I was at TRU right after they put out the case, and no two Ashes looked exactly alike. Since Ash spent all night getting splattered by various fluids, his light blue shirt is dark and stained. The exact placement of the light and dark areas varies from figure to figure, but in general the "clean" areas are limited to two patches around his ribs. The important thing is that they look like wet and dry cloth, not the specific millimeter where the color shifts. Another bit of paint that was different on every figure? The eyes. He can display different expressions depending on the way the pupils are applied: some look up, some look slightly off to the side... take a look and pick the one you like best. I went for one where the pupils are low, so the eyes look even wilder than usual. One area in which this Ash absolutely blows away any prior attempt is the articulation. McFarlane's figure was a lump, and when they did their two previous attempts, NECA's ability to do articulation wasn't as mature as it is today. This figure moves very well - maybe even better than he needs to! He has a balljointed head, swivel/hinge shoulders and elbows, balljointed wrists, balljointed torso (it's hidden away under the rubber shirt), swivel waist, a V-crotch, swivel thighs, swivel/hinge knees and balljointed ankles. I think the myriad Terminators proved we fans will happily buy figures that only have minimal leg articulation, so NECA did more than they had to. The paint has scraped off in the elbows, but since the shirt is multiple shades of blue already, it's not too bad in the long run. We also get a ton of cool accessories. For instance, the 12 gauge shotgun that would eventually become his "Boomstick." This is the full-sized piece, before he sawed off the barrels to make wielding it one-handed easier. He also gets an axe covered in green glop, just as it was in the film. His right hand is sculpted in its "possessed" state, so it looks very demonic. Since this figure is called "Farewell to Arms" Ash, you can probably guess where this is going. The arm pulls off at the elbow, and can be replaced by a stumpy version with no hand and a tourniquet made of rags and duct tape. We also get a free-roaming hand, lopped off at the wrist; you can even see the leftover pieces of the radius and ulna poking out the end. It's a great piece, and definitely something McToys never bothered with. 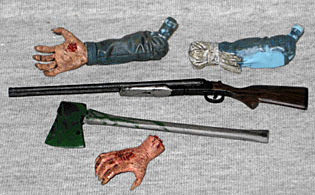 NECA has said that the Evil Dead 2 toys are not money-makers for them: they realize these might end up costing more to make than they bring in, but they still wanted to make them because they're fans of the property. With that in mind, it's really astounding the number of corners that they didn't cut. Above-average articulation, more accessories than you'd expect, the usual high level of sculpting talent... if you're a fan of the Evil Dead movies at all, you're going to want to buy these instantly. It would have been cool to get different heads, with some of Ash's zanier expressions, but we can understand why that didn't happen. Get shopping, now!